LOS ANGELES, Calif. (NBCNC) – Gavin Newsom breezed to victory in his bid for Governor of California. The lieutenant governor was promoted by Golden State voters to become chief executive of the nation’s most populous state as he easily defeated Republican John Cox on Tuesday. 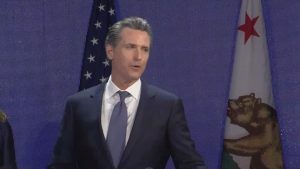 Newsom earlier on Tuesday said he would not be a candidate for president in 2020. But California’s progressive policies are a favorite punching bag of President Trump and Newsom told supporters in Los Angeles he’ll defend the state’s values. Newsom also thanked Governor Jerry Brown who’ll be leaving office after his second stint in the job.